With Spring and Summer fast approaching, it’s time to begin looking at outdoor living spaces. 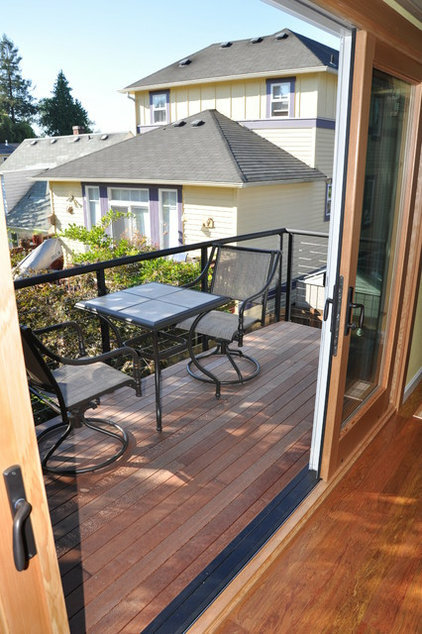 This article from Houzz.com provides good information on different types of decking materials and approximate costs. It’s natural to want your indoor spaces to seamlessly lead to outdoor spaces when the weather is right, so many homeowners look to decks to add more living room. 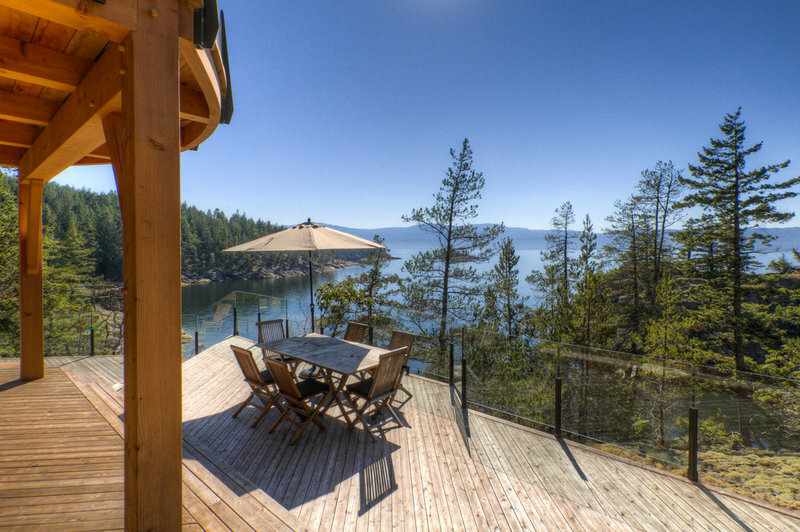 Traditionally, decks have been built from pressure-treated lumber and topped with common, locally available wooden finish materials — like tight-knot cedar and treated softwoods. But in the past 15 years or so, manufactured materials and tropical hardwoods have greatly increased the options, as well as installation methods. Here are some options to consider. The price ranges provided are per square foot (not lineal foot) in the Pacific Northwest for decking material only, and will vary by region and material dimensions. Tight-Knot Cedar, Redwood and Assorted Treated Softwoods Pros: These relatively low-cost materials are favorites for deck surfaces because of their budget-friendly price and widespread availability regionally. They are usually screwed or nailed on the top with the fasteners showing. Cons: To maintain color and preserve the wood, the decking needs to be treated, usually every couple of years. It is prone to decay over time, so expect to replace boards here and there about five to 10 years after the initial installation. Vertical-grain wood (without knots) tends to last longer than wood with knots. 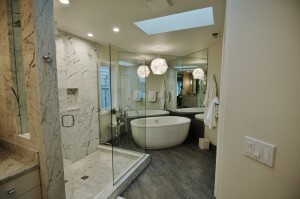 If you don’t treat the wood, it will change color and may be more prone to rotting or insect infestation. Pros: This very dense tropical hardwood has become popular in recent years as a longer-lasting alternative to commonly available woods. Ipe can be sealed to maintain its deep reddish color, or it can be left untreated, in which case it will turn a brownish gray over time. This material is said to last 25 years or more. Cons: You will pay more for this material. Also, the wood is so dense, it can burn out drill bits quickly. Installation: There are three ways to install ipe, each with a varying amount of labor and a different cost. The first option is to drill and countersink screws with the head exposed, which has the lowest labor cost. The second option is to drill and plug, which means that a hole is drilled through the material so that a screw can be installed below the surface of the board, then infilled with a small round piece of ipe that’s glued in place to cover the screw. Then it’s sanded down and finished with a sealer. Because ipe is so dense, this technique is labor intensive and dulls drill bits quickly. The final option with ipe is to router a groove along the side of the boards and use concealed fasteners to fit into these grooves, with the fasteners secured to joists below. The cost of the predrilled boards is higher — as is the cost of the fasteners — but the labor cost is lower. It may still be a wash on pricing, but the finished product will be more seamless. Tigerwood, Lacewood, Cumaru, Garapa Gold Etc. 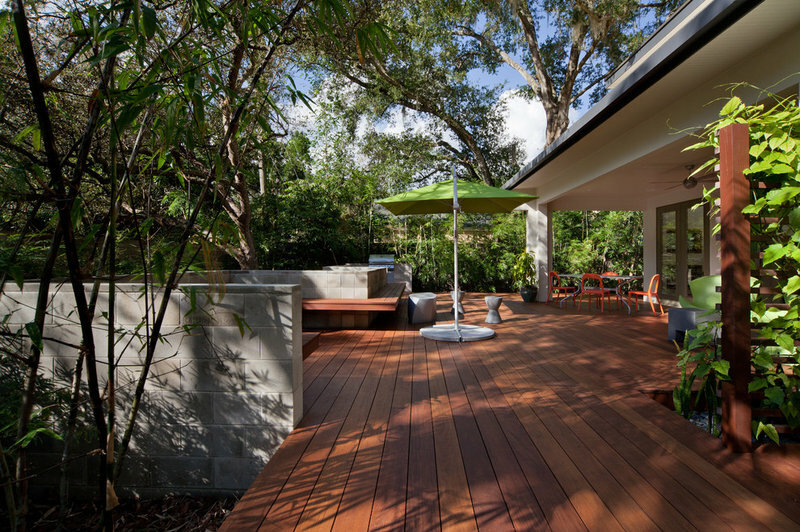 A wide variety of other tropical hardwoods is also available, with a range of cost, durability and performance, and the same installation options as ipe. Some have a grain that tends to rise when the wood is wet, some are more malleable for curved decks, and others have a variety of grain patterns. Pros: Nearly all have better rot and insect resistance and are denser than their domestic counterparts. Cons: These features also mean most of these woods come at a higher price. 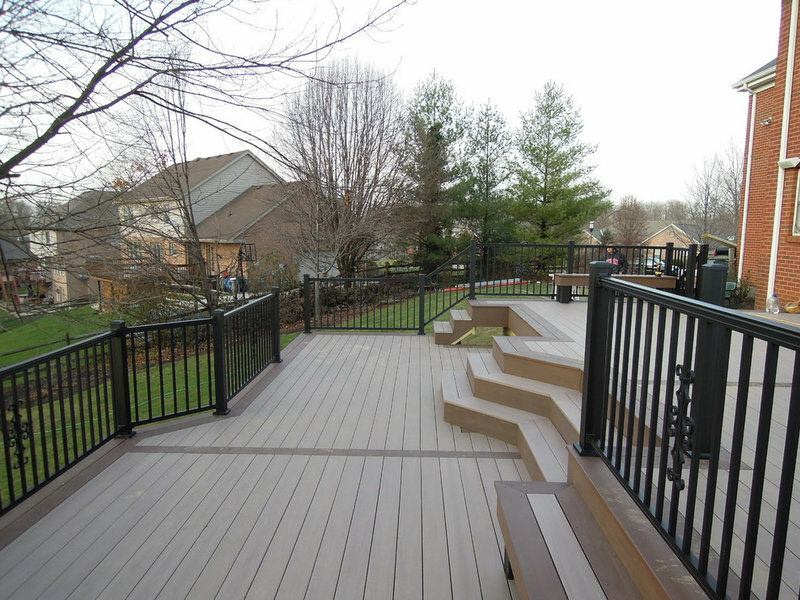 Composite Decking: For years the biggest name in composite decking was the only name. Now Trex has been joined by Timbertech, Fiberon and many more companies producing composite decking. Trex has the advantage of excellent brand recognition, plus the company has updated its product over time to improve on its original formulation, which had its share of performance issues. Pros: You won’t have to stain or treat the decking, and many types can be installed with concealed fasteners just like dense hardwoods. 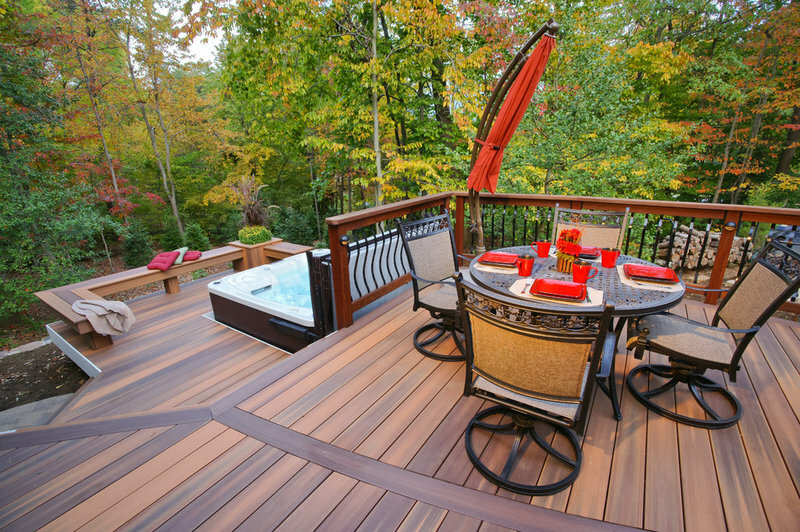 Composite decking manufacturers now offer not only different colors, but also textures and even copies of grain patterns of tropical hardwoods. Cons: In climates where green things grow on surfaces, no matter what you do, a power washer will still be necessary to keep your deck looking new. Pros: Manufacturers boast its resistance to stains and grease. 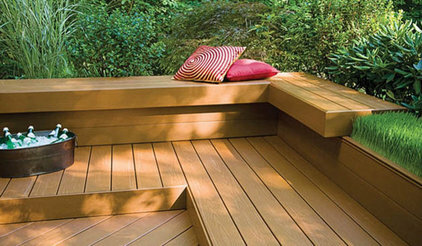 Similar to composite decking, no stain or treatment is required. 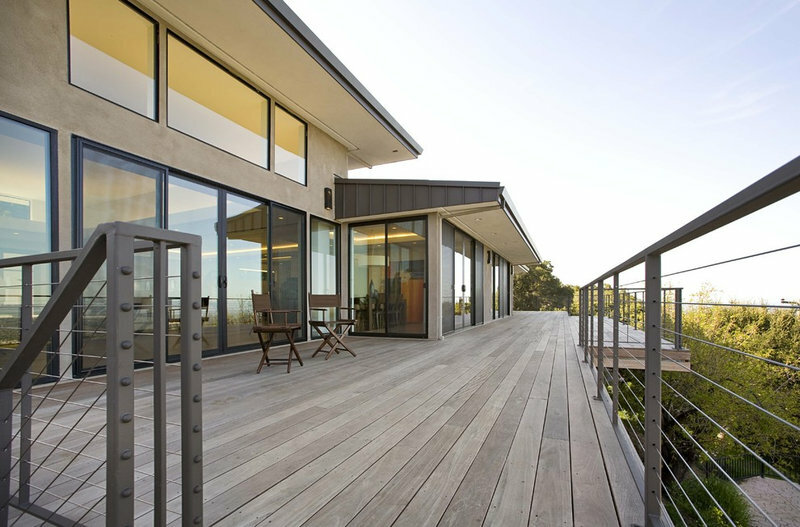 Low maintenance is a benefit, with the understanding that no decking material is truly maintenance free. Cons: Some plastic products can leave a mark if left on the decking over an extended period of time. If you select an engineered material like this, make sure to read the recommendations for cleaning and care. All of these decking materials have pros and cons, from how they feel on bare feet (including how hot they get), to how much dirt shows on the surface. The installer you hire will also likely have opinions about the best material and installation methods for your climate. Keep in mind that decking comes in a variety of thicknesses and lengths, and those can have a direct impact on price, particularly when you need only long lengths of wood instead of random lengths. Remember that decking labeled 5/4 inch thick has 30 percent more material than decking labeled 1 inch thick, so expect a higher charge for it. It’s useful to see decks installed recently and not so recently and hear from homeowners about what they do and don’t like about their decking to find the product that’s right for you and your lifestyle. 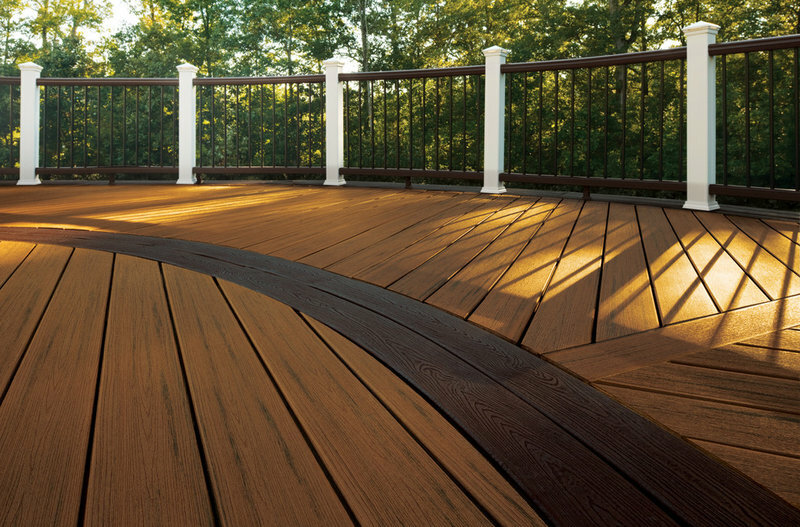 Tell us: Do you have a decking product you really like? Tell us how you chose the material and what you like about it. Explore our posts to find useful tips for home repair and maintenance.